We all know that gluten free eating can be challenging, especially when it comes to things like bread products. I love to bake, but I also like to keep a few convenience things on hand for those times when we are really busy. 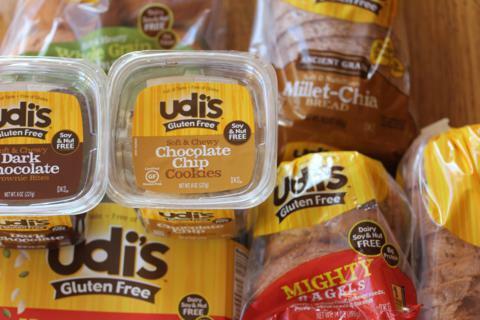 One of our favorite brands to keep in the freezer is Udi’s. We love their breads and their bagels are the best gluten free bagels we have tried. Udi’s recently sent me a box of their products to try in order to start the new year in a healthy gluten free way. Several of the products were ones I had not tried before and we really enjoyed trying them. 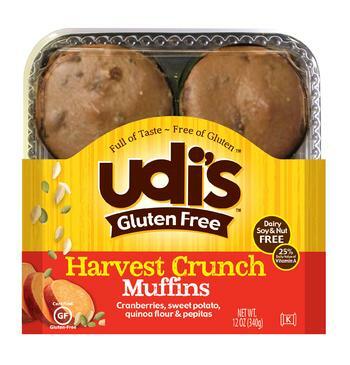 One of the items they sent were the harvest crunch muffins and I really liked them. Since my daughter has a nut allergy, we don’t use nuts in any baked goods, and I often miss that crunch and flavor that nuts give. The harvest crunch muffins contained pumpkin seeds and they added a nut like texture to the muffins that I really liked. In fact, it inspired me to to try pumpkin seeds in some of my homemade muffins. 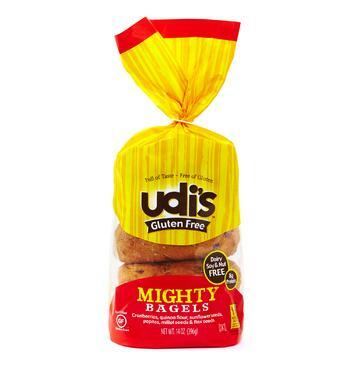 My daughter loves and misses bagels, so she really enjoyed the mighty bagels, and I enjoyed the fact that they were healthier than a normal gluten free bagel. And the soft and chewy cookies, what is not to like about soft and chewy cookies that are gluten free. They might not be the healthiest item, but we all need a good gluten free cookie once in a while. I would love to hear what Udi’s products you have tried recently or what Udi’s products are your favorite. Have you tried any of these? Note: I received free product to try, but my thoughts and opinions are my own.